The paper currency of Indonesia is in rupiah, and it comes in denominations of 1,000; 2,000; 5,000; 10,000; 20,000; 50,000 and 100,000 bills (there are also an assortment of coins). The front side of the 50,000 rupiah banknote shows a picture of “I Gusti Ngurah Rai.” He was a Lieutenant Colonel in the Indonesian armed forces and was designated as an Indonesian National Hero because of his courage while leading the military in Bali against the Dutch during the War of Independence. Born on January 30, 1917, and died in battle on November 20, 1946. 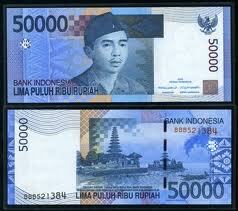 The back side of the 50,000 rupiah banknote has a picture of “Bratan Lake,” which is located on the island of Bali. Today, February 5, 2011, this Rp. 50,000 bill is worth $5.56 US dollars. Today, February 5, 2011, 1 United States dollars = 8,990 Indonesian Rupiah. The front side of the 10.000 rupiah banknote has a picture of Sultan Mahmud Badaruddin II, a leader from the city of Palembang, on the island of Sumatra. He was specifically known for his resistance to English and Dutch colonialism. On 14 July, 1827 Sultan M.B was captured and exiled to the island of Ternate, where he died in 1852. 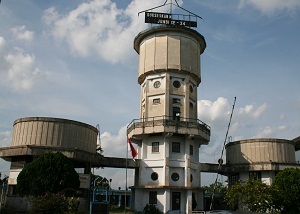 The international airport in the city of Palembang is named after Sultan Mahmud Badaruddin II. The back side of the 10.000 rupiah banknote shows a traditional Rumah Limas from the city of Palembang, South Sumatra. Today, February 3, 2011, this Rp. 10,000 bill is worth $1.10 US . 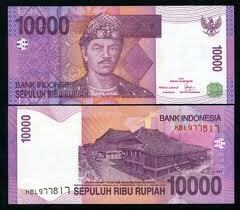 Today, February 3, 2011, 1 United States Dollars = 9,020 Indonesian Rupiah. 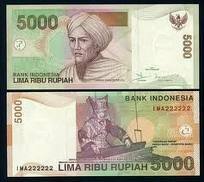 On the front side of the 5,000 rupiah banknote can be seen a picture of Tuanku Imam Bonjol (1772 – November 6, 1864). He received designation as an Indonesian national hero due to his leadership in the struggle against Dutch colonialism. His struggles with the Dutch took place in West Sumatra, among the Minangkabau ethnic group. The back side of the 5,000 rupiah banknote has a picture of a songket weaver from the Minangkabau ethnic group. The location where the majority of this weaving takes place is in the province of West Sumatra, and more specifically, in the village of “Pandai Sikat,” in the Tanah Datar regency of that province.